Lock in a great price for Rossiya - rated 8 by recent guests. Located good for convinient travelling outside city center (especially in morning rush hours) and close to airport. Excellent metro connection straight to city center. Location great for us, breakfast okay but no ATM at property (even though a sign in reception suggests otherwise, and very hard to get staff to assist sometimes (either do not know or language barrier re no or little English), especially with laundry, with definitely not one in the vicinity or that could be located or accessed by tourists. Beds okay, my room was fine, but friends rooms very tiny. Close to where I wanted to be and also to a metro. 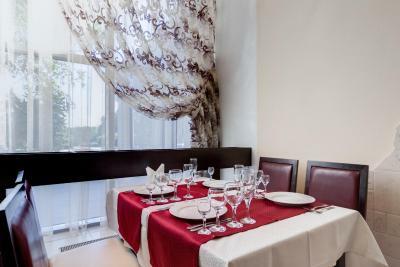 The hotel is located close to Park Pobiedy metro station - 5 minutes walking distance. Parking just outside the hotel, big grocery shop across the street. In the same building there are two restaurants, where wide variety of tasty food is offered. I really liked the Italian restaurant. In 5 minutes walk you can reach Moskovskiy Prosspekt - a long street with plenty of restaurants and coffee shops. If you like long walk - you can walk along the street to the city center, it would take around 1-1,5 hrs. Big shopping mall (Raduga) 10 minutes drive. There is a shuttle mini busses departing from the metro station to Raduga shopping mall. Staff at the reception was friendly and helpful. Bathroom was a reasonable size. Отзывчивый персонал. Чисто в номере. Белоснежные полотенца. Прекрасный завтрак (шведский стол). Хорошая цена. До метро близко. Теплые , чистые номера с прекрасным видом на парк. Завтрак шикарный. Близость к метро. Хороший ремонт и мягкие матрасы (останавливался там же 7 лет назад-разница чувствуется) Хороший завтрак. Стоянка под наблюдением у секьюрити. Featuring a lobby bar, this hotel offers comfortable guest rooms and suites. Benefit from a 24-hour front desk and free Wi-Fi in all areas. 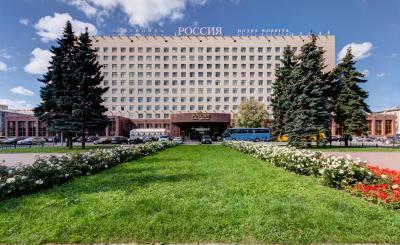 The Rossiya Hotel provides you with a peaceful base in between 2 green parks. 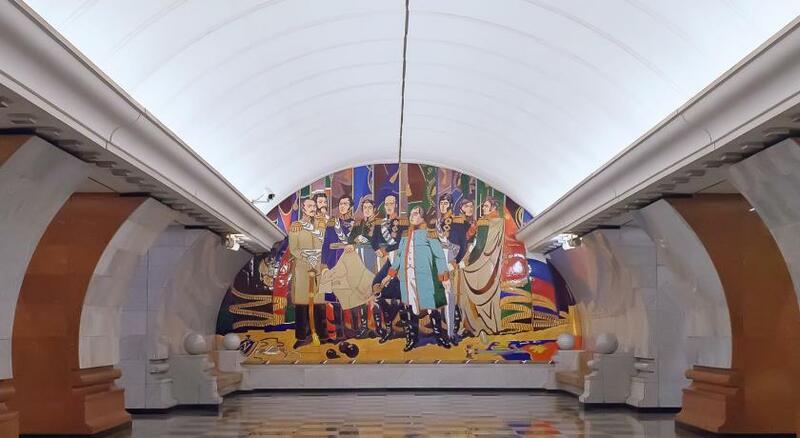 Make use of convenient transport links into St Petersburg via the metro station Park Pobedy nearby. 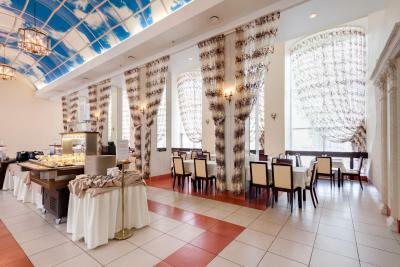 Wake up at the Rossiya each morning with a free breakfast buffet and plan your day at leisure. Enjoy round-the-clock service from the friendly staff at the reception. The distance to Pulkovo International Airport is 10 km, and the Sport and Concert complex is within a 10-minute walk. Moskovskiy district is a great choice for travellers interested in friendly locals, monuments and romance. Rossiya has been welcoming Booking.com guests since 21 Sept 2009. When would you like to stay at Rossiya? With a dresser and a TV. The bathroom has a shower, sink, toilet and hairdryer. A refrigerator can be provided on request. 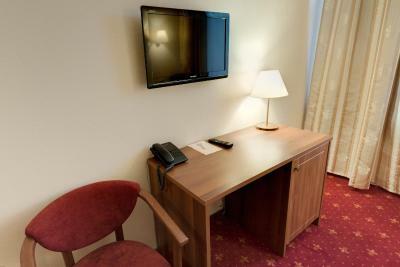 This room is equipped with a desk, telephone, LCD TV, refrigerator and a safety deposit box. Each room has a private bathroom with a shower, hair dryer and toilet. Hotel surroundings – This neighbourhood is a great choice for travellers interested in friendly locals, monuments and romance – Check location Great location - show map Guests loved walking around the neighbourhood! House rules Rossiya takes special requests - add in the next step! Rossiya accepts these cards and reserves the right to temporarily hold an amount prior to arrival. Not quite modern breakfast style. What the picture is showing in the website is different and the actual is different .Second thing the facilities in the picture of room when u book show tea/coffee makers buts its not .If you ask for suppliment things(towels) when you come from work in the night , they say you will receive that tomorrow as we dont have any stuff. Cleanness is that which is done so hurriedly that you can see things which u had eaten the last day or two back also in the room.Be prepared if you requested anything on the room service to come after 3-4 times reminder or after 1-2 hours. The food. Also the large windows in the rooms could open out wide. Tea in room, hot breakfast, I could not use the safe, no battery, I reported it but it did not get fixed. Cleaning staff left a vacuum cleaner across the corridor which was a trip hazard. For some reason none of the rooms have double beds. Putting two singles together really isn’t the answer. Some personnel were rude, the rooms are tiny. The check-in receptionist was not friendly and tend to be challenging but the check-out receptionist was really nice and cooperative. Excellent location Clean After I left the hotel, I called the hotel from the airport for the registration card and they were very responsive and cooperative. The room we had (stayed there with my wife) was very small! It was described as a 'business', but the size of the room was just enough to fit two single beds and a desk. Air conditioning in the room was not working. The AC unit was working as a ventilator... I didn't see on the walls of the building any cooler which should be connected to the AC inside the room... It seems like something is missing... I don't think that they have a central utility system with brine cooling, distributed across all rooms and supplying the room AC. Curtains ware quite thin, so if you can't sleep when it is not dark outside (this is the case for summer white nights), you won't sleep well.